It would not be an exaggeration to say that the dream of any gambling enthusiast worth his salt is to hit it big, i.e., hit the jackpot. Believers in luck and superstition may then view the auspiciously named All Jackpots Casino as promising paradise. Though obviously a jackpot will not be hit every time you try, there are still plenty of other reasons why you should make the effort to visit. Established in 2003 and licensed by the Kahnawake Gaming Commission, All Jackpots Casino is one of several gaming portals owned by the Jackpot Entertainment Group. It is powered by Microgaming which deservedly has earned a reputation in the industry for providing top quality titles with memorable gaming experience enhanced by impressive audio and visual effects. This review will touch certain points on customer service, the gaming catalogue and promotions available on site. In terms of customer service, the site is at par with the rest of industry. It offers contact points via phone, email and live chat. Seven toll-free numbers may be called, one each for the six countries of UK, Canada, the Netherlands, Australia, Italy and Germany, and another for all other countries. Unfortunately, live chat is only available for about 12 hours every day. A list of credit cards and electronic wallets may be used both for depositing and withdrawing funds but not all choices may be available for each country. 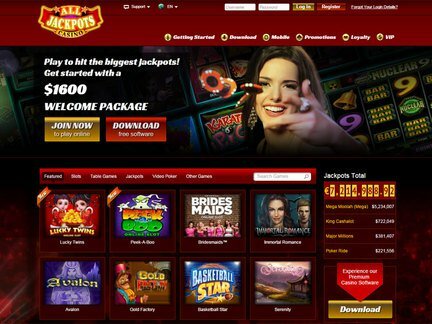 The gaming catalogue offered by All Jackpots Casino is expectedly wide and comprehensive, given that the software provider is Microgaming. Clients have a choice from over 400 titles. Slot games account for majority of these, and cover the whole gamut from classics, video and progressive jackpot slots. In case you are feeling extra competitive, you can also participate in slot tournaments, several of which could be going on at any given time and which are announced a month in advance. You can also expect to have new titles arrive regularly, and it is not unheard of to have the site offer special rewards as a way to introduce new games. Speaking of rewards, this portal endeavors to offer attractive incentives to both new players and its loyal clientele. The welcome package can be worth as much as $500 at a deposit match up rate of 100%. This comes with a 30x play through requirement and must be cleared within 30 days. The fun does not end there though. An annual bonus plan is in place that nets as much as $4,000. not to mention a loyalty program that earns points redeemable for cash or prizes. Hitting the jackpot does not seem hard at All Jackpots Casino.